Many of the classic neon signs in Alexandria were the work of a single company: The Craig Sign Company. 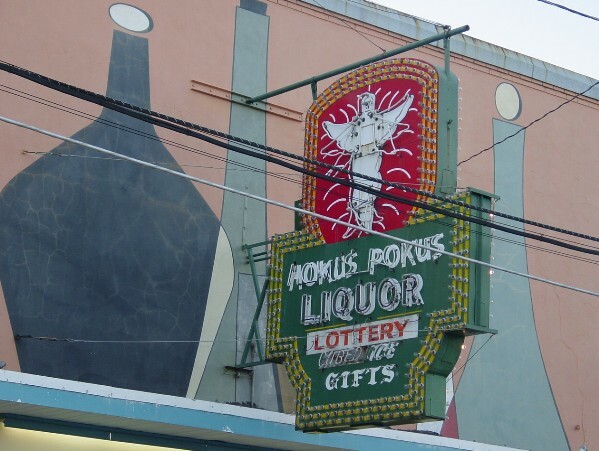 One of its best known, signature pieces was the Hokus Pokus Liquor "flying ghost" sign at 2130 Lee Street (see photo to the right). During World War II, the founder of the company, Cecil Duncan Craig, learned his sheet metal trade at Esler Field repairing aircraft. The original name of the company was the Louisiana Neon Sign Company. The name was later changed to the Louisiana Neon Sign Company operating as Craig Sign Service. The founder died in 1968, and his wife ran the company for several years, and then sold it to her son Louis Craig. He ran it several years then closed it. Shown below are twenty additional projects completed by the Craig Company in the Alexandria, Louisiana area. To start the slideshow, hover over the image below, and press the triangle button.